New 2018 Club Kits are now for sale. That’s right, the WCBC online Club store is now open and will remain open until midnight on Sunday, June 17th. We are offering jerseys, shorts, bib-shorts, and accessories in colorful design of our Club colors. The web store provides a detailed description of each items along with information about fit, fabric, and pricing. With regard to fit, I have a Fit Kit of Samples from the manufacturer so you can determine what fits you best before you order. No one wants to place an order, wait a few weeks for the item or items to show up only to find that your best guess was not right and now you have to ship things back for a different size. Don’t let that happen to you, come to the Annual Picnic on Saturday, June 9th to try on jerseys, bibs, shorts, warmers, etc. in Men’s and Women’s specific sizes in the lines that will be offered. If you plan to place an order, it will be worth an hour of your time on Saturday. 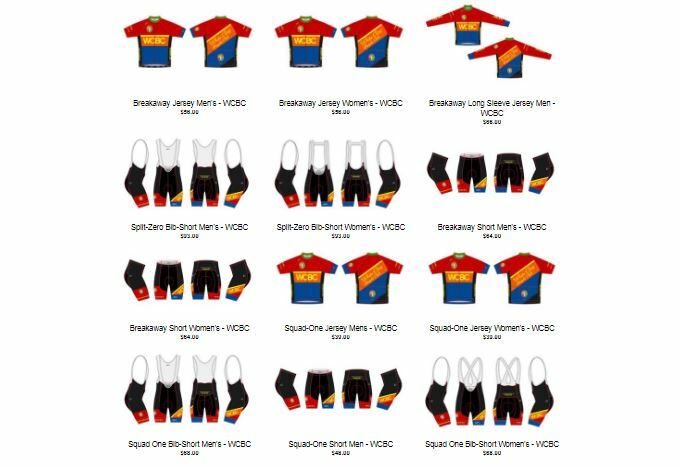 See the prior posting (http://whiteclaybicycleclub.org/message-from-the-president-new-club-kits-for-2018/) for more details about the different lines being offered (Squad One, Breakaway and Split Zero). With regard to pricing, due to the size of our club and the anticipated level of orders, Athlos is offering the Club the best discounted prices they can – for this initial store opening. Take advantage of WCBC custom high quality apparel and accessories in Women’s and Men’s specific cut and sizing at a price that you can’t beat anywhere else. On the web store we are also offering cooler weather gear such as long sleeved jerseys, vests, shells, and arm/knee/leg warmers. With summer finally upon us, you may not feel a need to make those purchases at this time so I wanted to you to know that the store will reopen toward the end of summer so you can purchase the cooler weather riding gear. Go ahead and get that extra jersey or pair of shorts or bibs so you have Club apparel to get you thru the busy riding season. Let me know if you have any questions at president@whiteclaybicycleclub.org. ← Message From the President – New Club Kits for 2018!